I need your help to determine how Real Estate professionals feel about using artwork in training materials. Please take a moment to read the following paragrah, check the cartoon below and answer the questions underneath in the comments. Thank you. The Lean Canvas business model is a very effective yet time-saving alternative to traditional business planning. It involves defining your customer segment and narrowing it down to a very specific niche market. 1. 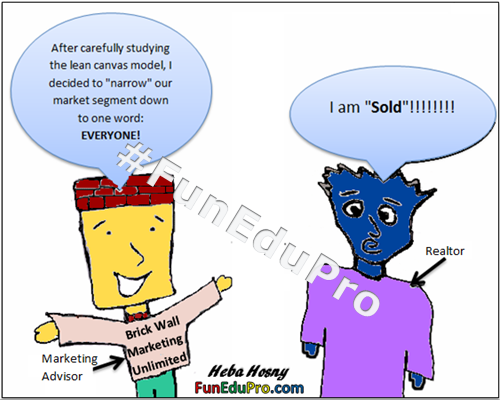 Did the cartoon help in clarifying the Lean Canvas customer segmentation concept? 2. Generally speaking, do you think that including artwork in Real Estate training material can add value to it? In other words, do you feel that the cartoon did or (did not) detract from the training material professionalism? Thanks in advance for sharing your thoughts. Your valuable contribution is much appreciated.